What do EDS, Ericsson, Center for Sales Strategy, IdeaChampions, Acara Global, Byrne Dairy, Cleveland Clinic, Magpie, DOJ/FBI, HP, Hewlett Packard, Intervista Institute, Fryett Consulting Group, Satellite Shelters, ProductVentures, Speakeasy - a Best Buy company, Jarden Consumer Solutions, Hallmark, Infinium, DeakinPrime - Deakin University, Lucas-TVS, McCann Worldgroup, S.P.Jain Center of Management, Suffolk University, RiCoMan, AmpControl, Craig Rispin, Momentive, Champion Laboratories, University of Phoenix, University of Washington, SFR - Neufbox, Attwood as Edison, Academy of Sport, Ideogenesis, Principled Innovation, Meridian Partners, Ananzi, Tangibility, Syngenta Global, Speedy, The Business Lab, Deloitte, Lane Management, University of California at Irvine, Wharton Business School, Babson University, Larsen & Toubro, Nokia, Credera, Pfizer, Bilkent University, Indian Institute of Sciences, Chick-Fil-A, Pepsi, LG, SAP, TATA and 1,000+ innovators have in common? 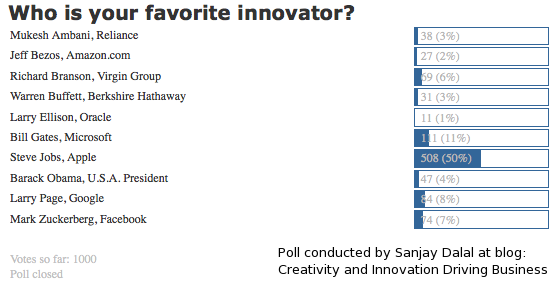 They are all using the key tenets of the industry leading Innovation eBook & Resource Kit - Faculty eBook and Definitive Guide on Creativity And Innovation in Business everyday! We invite you to download the Innovation eBook & Resource Kit today that will inspire you to become an innovator, and unleash your creativity. Engaging Online Workshops to Jumpstart Innovation at your business. The Innovation Bootcamp is a series of engaging online workshops to jumpstart innovation, entrepreneurship and creativity at your business. Learn how Top Innovators in the world innovate and grow their business successfully. Unblock your creativity, spark new ideas, become an innovator and create game-changing innovations. Get Inspired! Change yourself and change your business! Accelerate and Grow your business! What is your current Innovation Challenge? We are here to help you seek out great new opportunities, and solve your toughest innovation challenges. Post your Innovation Challenge today, and we will respond to your request right away. Let us help you grow your business! Learn more about our Innovation Services and contact us to get started. BUSINESS INNOVATION EBOOK is a 212-page collection of over 55 best practices, case studies, and insights on the current state of Innovation in Business at Top Innovators including Apple, Google, Netflix, 3M, Proctor and Gamble, Johnson and Johnson, Toyota, GE, BMW, Deloitte, Frito Lay, IBM, Nike, Starbucks, Southwest Airlines, Microsoft, Dell, Intel and more. With pertinent articles from the award-winning Creativity And Innovation Driving Business Blog, this Faculty eBook provides real-world examples on how the Top Innovators innovate and grow their business successfully time and again, especially during economic cycles. Creativity And Innovation in Business is a definitive guide that will help you unblock creativity, uncover and create game-changing innovations, and make exponential business growth a reality. The Innovation eBook is in sixth edition, and has added brand new chapters on Ideas to Innovations, Questions Lead to Creativity, GM Turnaround, Innovation Insights and Wisdom, Turning Complaints into Innovations, Expanding Innovation Capacity and much more. * The complete Innovation Bootcamp presentation and handouts (for all six workshop sessions) containing over 400 presentation slides to spark new ideas, channel team creativity and create innovation factory. Learn More about our market leading Innovation eBook and Business Innovation ToolKit.